Many people are familiar with the term ROI or “Return on Investment” as it pertains to their personal financial ventures. Most of us have been taught to look for investments that generate a return over time in the form of both cash flow and capital appreciation. (Although many people ignore cash flows in the search of “quick money” from price appreciation) When that return is compared against our initial investment amount, it yields the “Return on Investment” for our capital. In many cases, this is a good way to measure the effectiveness of our financial investments. It is especially effective for investments that are made with cash, since the value the asset and the value of our investment in the asset are the same over time. In this way, the returns generated by the investment compared to the amount we initially invested provide a valuable insight into the performance of our capital. However, this situation flips considerably when we pursue investments that require financing such as income property. The reason for this is because our net equity position in income property changes over time. When the value of the property increases, our equity position increases in line with the asset value, while the amount we borrowed stays flat. This is typically viewed as an advantageous situation since leverage allows us to build wealth very quickly from value appreciation. The thing that we need to understand is that leveraged equity appreciation can also lead to a situation where our total investment portfolio performance becomes overweight and sluggish. The danger of this situation is that it gives every appearance of generating a great return on investment. After all, when the value is going up, and the cash flow is going up, what could possibly be wrong? 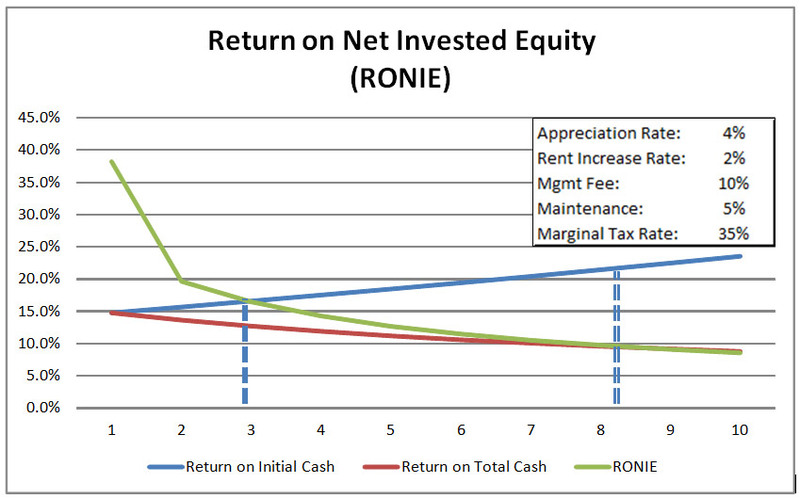 The way that we demonstrate this principal is through a metric called “Return on Net Invested Equity” (RONIE). It is calculated by comparing the annual cash flow of an investment against the equity position in the property, net of taxes and fees to sell. We created a model based on a target PPIN income property with a 4% appreciation rate, and 2% rent increase rate. For the purpose of comparison, we are contrasting RONIE against the return on initial cash (Traditional ROI) and return on total cash, or an adjusted ROI that includes all of the residual cash flows in the amount invested. When we graph out the relative performance of our target property, a few key factors emerge very quickly. The first is that the return on net invested equity for the initial year of the property, since the net equity position is very small due to the fees and taxes associated with selling before owning the property for 12 months. As time goes by, the return on initial cash invested will increase as rents inflate, but the return on total cash will decrease as the net equity position grows faster than the cash flows. There are two crossover points that are important to take notice of. The first is when the RONIE crosses over the return on initial cash, and the second is when it crosses the return on total cash. The significance of these crossover points is that they represent a degrading “net” performance for your property. What all of this means is that the best way to keep your portfolio “financially fit” is to re-invest the net equity when your returns degrade below your return on initial cash invested. This will allow you to “super charge” your wealth creation by accelerating the pace at which you grow your portfolio of assets. This strategy even works in situations where the growth of value is tied to the growth in rents, such as a commercial property. 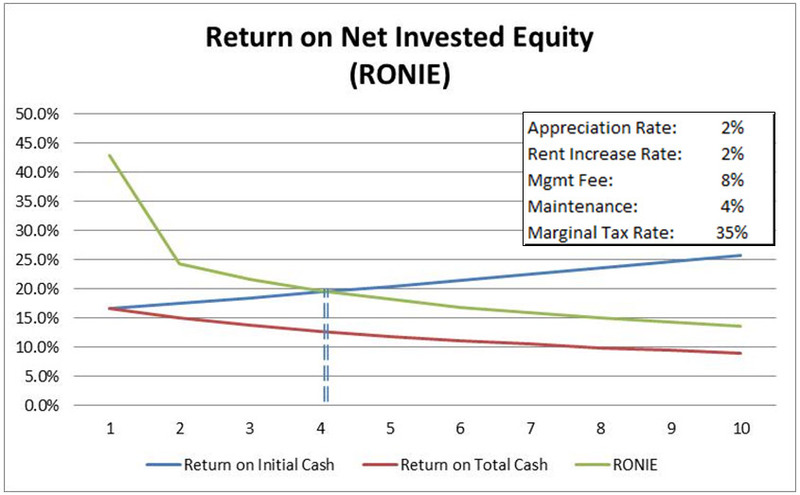 In this situation, the difference is that RONIE does decline quite as rapidly since the net equity is not growing quite as fast. The model we have built is the same as in the prior example, except that it assumes a 2% appreciation rate instead of 4%. What we quickly see is that the optimal point of re-investment still occurs relatively soon even in a much more conservative investment situation. This means that keeping our portfolio financially fit means constantly monitoring our return on net equity so that we pick the right time to harvest that equity and re-invest to grow our wealth portfolio more quickly. Keeping your portfolio on the cutting edge means constantly monitoring the rates of return that you are earning relative to your total net equity position so that you can avoid the trap of allowing your equity to become lazy. As your capital base grows, it is likely that your strategy may begin to shift in a more conservative direction. However, the key factor for investors in the growth phase of their wealth building is to keep their portfolio, fit trim, and constantly improving. Action Item: Portfolio fitness is all about preventing our capital from becoming lazy. By consistently monitoring our return on net equity, it allows us to re-invest at the optimal time to accelerate compounding and generate rates of return that are lean, fit, and deliver us to the promised land of wealth and prosperity.